With Dear John coming out, this just had to be done. Two young lovers (Ryan Gosling and Rachel McAdams) are torn apart by war and class differences in the 1940s in this adaptation of Nicholas Sparks’s best-selling novel. Their story is told by a man (James Garner) who, years later, reads from a notebook while he visits a woman in a nursing home (Gena Rowlands). This film since the time it came out has had chicks all over the world, just crying their eyes out saying “I love this movie, it’s so sad and romantic”. For me, I never wanted to buy into this crap, but I did, and I’m actually glad I did. Now when it comes to melodramatic romances, this film is pretty high up there. I mean there are plenty of times where I was reminded of some of the other great Romance stories, and this film does it very well. The film is a tearjerker and at some scenes I did get a bit emotional, not totally, but a bit. Just the general romance between these two and how they still are able to love one another, actually makes this film worthwhile. The problem with this film is that it is a very predictable and obvious story. I mean the constant flashbacks kind of pissed me off cause they gave away the ending to the story which would have kept me wondering till the end what was going to happen to these two. Also, though it doesn’t matter to me in some movies, the score in this film just didn’t feel right. There were little pieces that could have been a lot more emotional if given the right type of movement within the music, I don’t know it’s just me though. Much of the praise goes to the chemistry between its two stars. Gosling as always is great, and shows that he can play those toned-down roles like the back of his hand. But the best here is Rachel McAdams who much to my surprise here is given such a difficult role that calls for a lot of changes and emotion, and mostly on every note she hits it very well. Their love feels real by the end of the film and not just because the film is trying to tell you that, is cause when they talk they talk like real people. 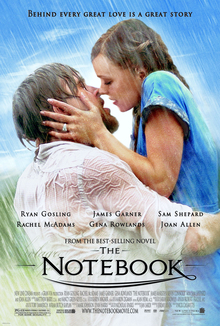 Consensus: Though it has an obvious predictable story with an over-done score, The Notebook features enough emotional depth, and wonderful chemistry to keep me entertained throughout this sappy tearjerker. This movie is so cheesy and corny but somehow, it just really works. I must admit it got me really good the first time and some of the more emotional scenes are still worth watching years later which demonstrates of the powerful performances that were given in this “fluffy” movie. All 4 main actors were very good but the movie would not be half as good without a great female protagonist and Rachel McAdams absolutely nails it out of the ballpark which was a great surprise because at the time, she was very little known. Although the old Noah (Duke) and Allie story line is touching, I thought it was redundant and they should have stuck with the young ones instead but I guess they had to follow the book.